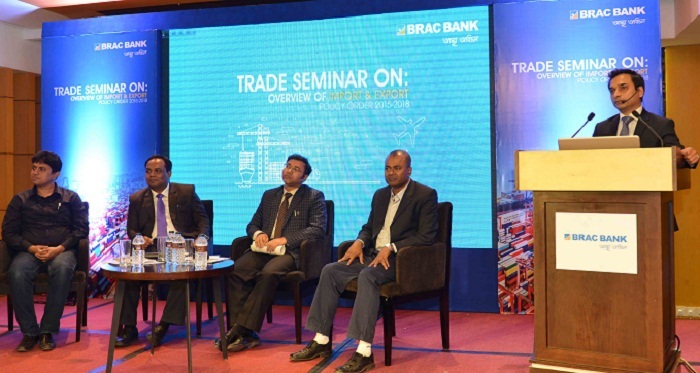 BRAC Bank Limited organised a Trade Seminar on “Overview of Import & Export Policy 2015-2018” to create awareness among bank’s valued corporate customers. Nandan Kumar Banik, Joint Controller, the Office of Chief Controller of Import and Export, made a presentation on overview of Import and Export Policy and addressed queries raised from valued customers. Jabedul Alam, Head of Trade Development, moderated a panel discussion on “Market practice vs. Import and Export policy” where Nandan Kumar Banik, Mohammad Tipu Sultan, Ashraful Ambia and Md. Mostafa Kamal participated. Selim RF Hussain, Managing Director and CEO, Tareq Refat Ullah Khan, Head of Corporate Banking, senior officials of Corporate Banking Division and Corporate Branches were also present. The seminar was organised as part of the bank’s pursuit of becoming the most preferred trade bank of the country.